J.J. Cook writes award-winning, bestselling mystery fiction as themselves, Joyce and Jim Lavene, and Ellie Grant. They have written and published more than 70 novels for Harlequin, Berkley, Amazon, and Gallery Books along with hundreds of non-fiction articles for national and regional publications. They live in rural North Carolina with their family. And I am very pleased that Joyce is here today to tell us about the research they for the book. (Be sure to leave a comment for a chance to win a copy of the book.) Welcome Joyce. Doing research for the Biscuit Bowl Food Truck Mysteries was both delicious, and amazing. We spent time with several food truck owners, shadowing them through their days. It’s incredible what they can do in such small spaces. Food truck drivers get up early for the best spots. Getting there first can mean the difference between a good sales day, and a day where you don’t break even. So most people get up at four or five a.m. They usually get some of the food ready in a stationary kitchen before they leave for the day, like Zoe bakes her biscuits before she leaves her diner. Inside a food truck, everything is very compact. Owners have to know where each item is so they can find it quickly and easily. They know they can be checked at any time by health inspectors so they have to be very careful with their refrigerators and cooking utensils. Sometimes the space in a food truck is at a premium, especially when there is more than one person working in the kitchen. Most food trucks pick specific menus for each day. They don’t have enough space to change the food they’re making. If the menu says chicken salad, that’s probably what you’re going to get. But because they are only making chicken salad – wow! It’s the best! Zoe picks one or two types of savory fillings for her biscuit bowls each day, and one or two types of sweet fillings. She can’t make exceptions because that’s all she has with her. Her biscuits are deep-fried and kept warm, but only in small batches. They will go soft quickly. She usually only carries one type of drink. We tried to pattern Zoe and her Biscuit Bowl food truck on real-life food truck owners. Of course, Zoe’s life is fiction, so sometimes that shows up. We didn’t meet any food truck drivers that had large cats like Crème Brulee with them when they went out – although we did meet a few foodies who brought dogs with them. Zoe is a hard worker, as are the food truck operators we met. For many of them, they are hopeful that their food truck is a stepping-stone to a restaurant. Not all feel that way. Many are just happy following their dreams, working for themselves with their favorite food. I have only one complaint about this book. Well, two. It is going to cost me time and money. Time experimenting making biscuit bowls and money for the groceries. Oh yeah, there is a third thing. Listening to my husband complain about how good they are so please stop making them or he will have to spend half the day in the gym. In other words, I LOVED THIS BOOK!!! And my husband loves biscuit bowls. As a fan in real life of food trucks, I knew they would soon become part of a cozy series. And what a great start this food truck mystery is off to. Zoe is an appealing character. And all the secondary characters are interesting and you know you will want to see them all again. Most of all, it was a good mystery. I thought I had guessed the killer (and a pretty good twist if I do say so) but alas, or gladly, I was wrong. Bigger, better twist and better ending. From the wonderful cover to the recipe at the end, this is a solid ♥♥♥♥♥ and I can’t wait for the next in this new series. Really can’t wait to read this! Love the Mexican food trucks in Houston! Sounds like a good start to a series! 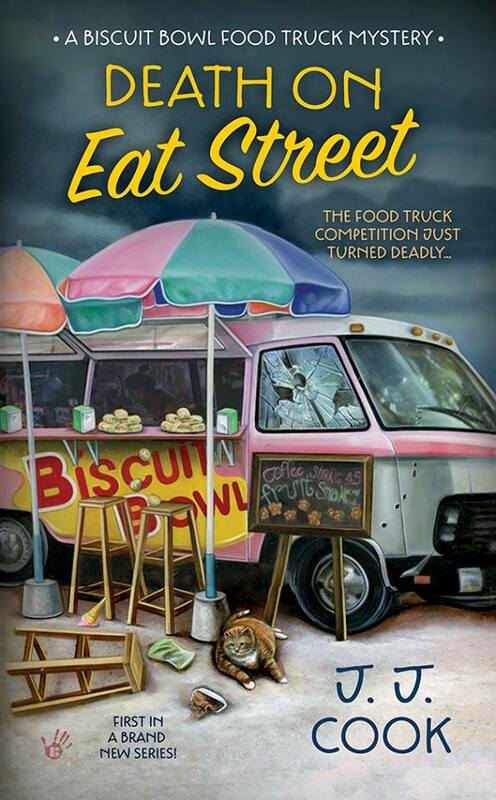 I love food trucks and I’m looking forward to reading this book. I love the idea of a food truck. We don’t have any where I live. This book sounds like a wonderful read. The cover is so cute. Thanks for having the giveaway. I’ve read another book by this writing team and really enjoyed it. I would love to read this book! It sounds interesting! Thanks for the chance to win! I have read another book by this writing team and really enjoyed it! I would love to read this book, it sounds interesting! Thanks for the chance to win! I have read a few books by this couple and have very much enjoyed them. Thanks fore the chance to win. This is one that I would love to read, and now it is on my TBR list! What a great concept! I’d love to read it! This one is on my list! I’ve always found food trucks to be intriguing but I don’t live near a city to go and watch one in action or to eat from one. I’ve also thought of starting my own and offering cupcakes. Sounds like just the type of book I love to read.Looking forward to it. This sounds like it will be a fun and fascinating series. Look forward to reading this.